Micro jobs on internet are really a great way to work and earn few bucks from internet from your skills. The idea is really simple. You provide a service that you would like to do and a job that a Buyer would like some one else to do for him by just spending few bucks. First and the most important thing for you is to decide weather the service you are providing, you want to do it professionally (as a job) or you just want to make some extra bucks online. Yes there are people who are working on micro job websites full time as a job. If you want to do it professionally then fiverr.com is best place for you. Fiverr.com is more professional and is of very high standards then any other micro job websites. Then third comes the real value of your gig, the expenditure and profit margins. If your work requires a lot of hard work or have a expenditure in performing the job before delivering it, In such cases to do it for $5 is just not worth it. (Example of such high value gigs are- getting photographs of a particular area or on a particular theme, this includes fuel cost OR precise and deep research on a topic, this includes electricity cost and requires a lot of time etc. · Good response on high competition gigs. 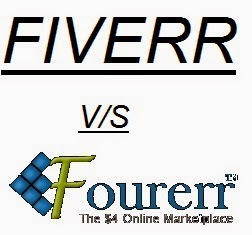 At last I want to say that both websites (Fiverr and Fourerr) are best in their own way. I hope now you can decide which one is best for you. Best of luck and I hope you get a lot sales. If you have any questions you can leave them in comment section below. Thank you.